We started decorating for Christmas yesterday, so the season is definitely upon us. I know that MANY of you have always had a desire to visit Cape May during the Christmas season and enjoy the magic that exists here during that time. In fact, lots of you have already made plans to do so. We’ve never had as many December reservations as we do this year. If you’re hoping for a holiday visit, but haven’t made your plans yet, don’t despair. We still have plenty of availability during the last two weeks of December. 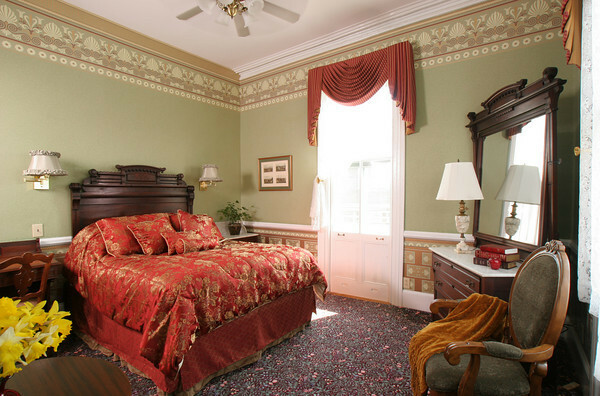 In addition, we still have rooms available for the Thanksgiving weekend, which is always the date that we’re completely decorated by. Of course, a New Year’s visit is also a great way to experience Christmas and a little bit more. With the way the calendar works out this year, we’ll be fully decorated through Jan 5, 2015, giving you an opportunity to take advantage of our lowest rates of the year and still experience the joys of a Cape May Christmas on the first weekend of the year. It struck me the other day, as October passed into November, that it was time to start thinking about a special gift for my wonderful wife for Christmas. I’m still struggling with it. It is really frustrating because I can’t give her what I know to be the best possible Christmas gift. You guessed it … a Queen Victoria gift certificate. Next weekend marks the first channeling weekend with Debbie Wojciechowski. Debbie comes to us very highly recommended by a veteran of several channeling weekends at The Queen Victoria who commented that “she is at least as good as Craig McManus” (which is high praise). We still have some availability for next weekend, and a few seats left for the channeling sessions. Don’t miss your opportunity to share this amazing experience! Every year we have 10 to 20 couples celebrating Christmas at The Queen Victoria. There are lots of great reasons you might consider it yourself. 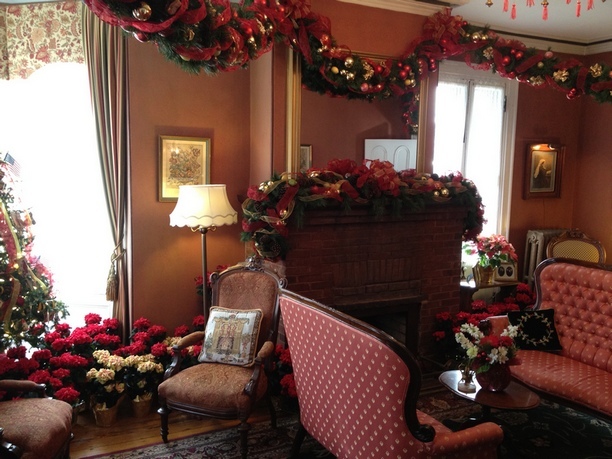 Empty Nester’s who’s children are celebrating with the in-laws (usually on a every other year schedule) find the warmth and charm of The Queen Victoria is a nice alternative to their quiet, empty home during Christmas. Sharing Christmas breakfast at The Queen Victoria dining room and spending a relaxing day in our festively decorated inn is a great way to go. Families separated by the miles often celebrate Christmas at The Queen Victoria too. 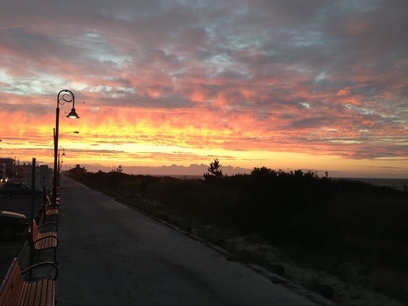 Cape May is often a great “half-way” meeting destination for a family gathering. The fact that nobody has to cook or clean for the gathering may be the best reason of all for these families to celebrate Christmas at The Queen Victoria. Some couples just want to spend a quiet, relaxing Christmas in our little Christmas fantasy village, escaping the hustle and bustle of the holiday season. Whatever your reason might be for seeking a welcoming, festive, and relaxing place to celebrate Christmas, The Queen Victoria is the perfect place to do it. We still have plenty of availability over Christmas, including the perfect room for you! I’m amazed and thrilled to announce that The Queen Victoria is completely booked (sold out) for the 2014 Dickens Extravaganza! This event has experienced an amazing renaissance over the last 3 years, and is now as popular as it has ever been. If you were planning on attending, but hadn’t quite gotten around to booking at The Queen Victoria, there are still some other participating inns that you can stay at. You can also start making your plans for the 2015 Dickens Extravaganza and book your room now so you don’t miss it again! Prince Alfred is our best “Balcony” room. It is also a very beautiful, bright, comfortable room. Let me tell you about it. First of all, the balcony is huge. Because the room is on the corner of the building, the balcony wraps around the room, basically giving you two different balconies; one facing the beach with an ocean view, and one facing The Queen Victoria building (great for sunsets!). In fact, there are two “doors” (actually pocket windows) that access the porch, each one with a set of rocking chairs. Even in the winter, on a sunny day, you can enjoy your balcony and the wonderful views it affords. Inside, Prince Alfred is elegant. With 13.5’ ceilings, plaster crown moldings, a classically beautiful frieze, subtle wall coverings, and striking Eastlake furniture, the Prince Alfred room is sure to put a smile on your face every time you step through the door. The bathroom features a step in shower, marble floors, a long vanity counter, huge mirror and heated towel bar. Every year Anna Marie and I purchase a LOT of these very special poinsettias. We order a lot more than we need, because so many of our guests have asked to purchase them over the years. This year we made our biggest order ever to be sure we wouldn’t run out. If you’re looking to decorate you home for the holidays and love the idea of fresh flowers, especially something as beautiful and distinctive as these, then you won’t be able to resist taking one of these beauties home with you during your holiday season visit to The Queen Victoria. Of course, these also make wonderful gifts for the dog sitters, baby sitters, or house sitters that you counted on to make your visit to The Queen Victoria possible. And remember, half of the fun is searching through the inn to find your favorite. 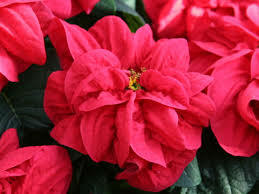 Our poinsettias will be delivered in time for Thanksgiving weekend. OK, I’m a sucker for a great sunrise. If you’re a fan of our Facebook page, you already know this. Almost every morning I take a brisk walk along the beach. I’m usually pretty focused on my workout and rarely stop for anything, but a breathtaking sunrise will stop me in my tracks every time. This is one of those. This one has all the elements necessary for a great sunrise photo. First of all, the sun is just coming up. The clouds are what really make this sunrise beautiful, of course, giving the view some texture, color and character. I also like the silhouette of the lamp posts on the left and the way the orange sunlight is reflecting off of the benches. So, after months of waiting for our custom draperies to be made by our designer, we’re proud to share with you our stunning new look. The new drapes went up in our Prince Albert dining room about 3 weeks ago, and I have to say that I really love the way they turned out. As you can see, the new look is much more elegant than before, giving the room a very special feeling. 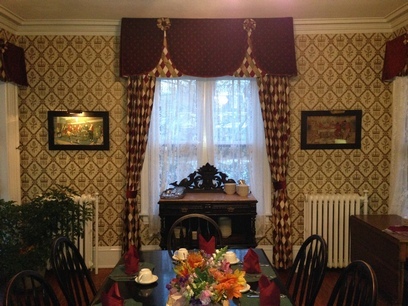 We’ve also rearranged some of the furniture in the dining room, which enhances the feel of the room as well. The room has really been transformed. I can’t show it to you here (only 1 new item a month, you know), but we also upgraded the drapes in the parlor of Prince Albert Hall. Stay tuned until next month! 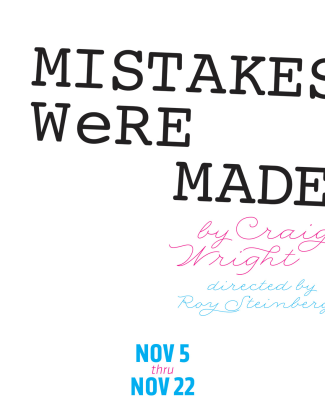 Craig Wright’s hilarious Mistakes Were Made is the story of a not-so-successful Broadway producer about to embark on a play of epic proportions. It’s a compact cosmic gem of philosophy and funny-business from the Emmy-nominated writer of Six Feet Under and the award-winning playwright of Lady Grace and The Pavilion. Anna Marie and I love a good comedy, and we love Cape May Stage. You can bet that we’ll be enjoying this play within the next few days. You’ve heard me talk about wine and wineries a lot, I’m sure. For those of you who favor a different beverage, I HIGHLY suggest a visit to the Cape May Brewery. 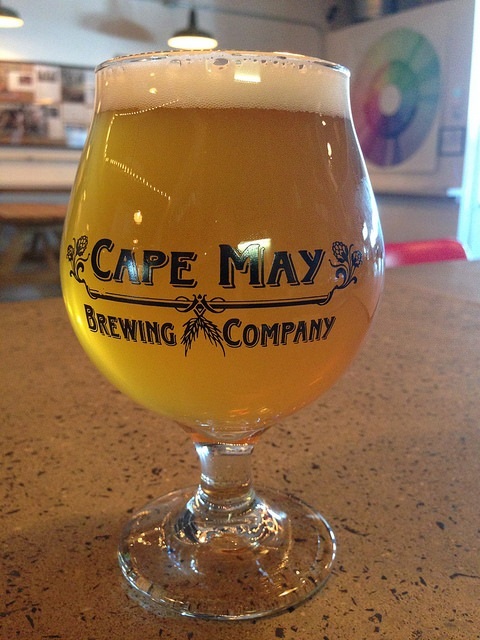 The Cape May Brewery is located at the Cape May airport, about 5.5 miles from The Queen Victoria. In fact, you only have to make 3 turns in your car to get there. They usually offer 10-12 beers on tap, with a variety that is sure to please just about anybody who likes beer at all. For those who don’t favor beer, like Anna Marie, there is a fantastic root beer that is probably worth the trip on its own. I’m particularly fond of the Cape May IPA (India Pale Ale). The offerings are constantly changing too, so each visit to the brewery will be a different experience. Tours of the brewery are offered several times a day. As you plan your next “Cool Weather” visit to The Queen Victoria, include some time for a visit to the Cape May Brewery. I know you’ll be glad you did. If you’ve ever asked me about restaurants, then I’m sure you’ve heard me say that Freda’s Cafe is one of our favorite Cape May restaurants. Pictured above are Freda’s famous Crab Cakes. Even a cursory glance will convince you that these crab cakes are mostly big lumps of crab meat, and little else. In fact, I’m not quite sure what holds them together. They’re served on a bed of garlic mashed potatoes with a mango sauce drizzled over them. This is truly a magnificent meal. Honestly, though, everything at Freda’s is amazing. In recent weeks Steve has been featuring a stuffed Swordfish special which is beyond description. Suffice it to say that I’ve ordered it every time I’ve seen it on the specials menu. I know that Freda’s Cafe is already a favorite of MANY of our guests. If you haven’t tried it yourself yet, I highly suggest it during your next visit to The Queen Victoria. To go to Freda’s is to love Freda’s.